Earlier this week, Slate reported that the EPA is considering a new rule for 2016 that could impact the use of methylene chloride (also known as dichloromethane), a chemical commonly found in paint strippers. The rule could result in anything from new warning label requirements to an outright ban. According to OSHA, workers using methylene chloride “are at increased risk of developing cancer, adverse effects on the heart, central nervous system and liver, and skin or eye irritation.” While the Slate piece emphasized the risk of sudden, fatal heart attacks, methylene chloride can also pose serious health dangers when absorbed through the skin. (Methylene chloride will eat through latex gloves, so workers need rubber or PVA gloves to stay protected.) In recent years, OSHA has issued hazard alerts for methylene chloride, with a special focus on the dangers it poses for workers engaged in bathtub refinishing. According to OSHA, at least 14 American workers died refinishing bathtubs due to methylene chloride exposure between 2000 and 2013. 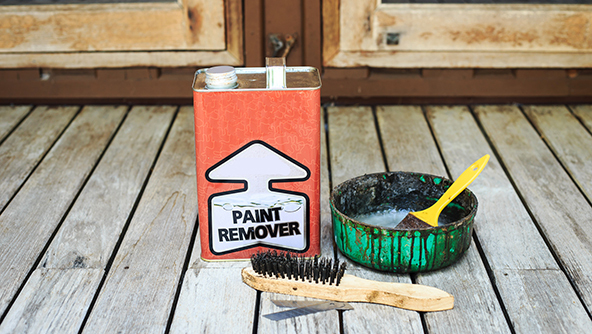 In addition to paint removal products, methylene chloride is also used in the manufacture of decaffeinated coffee and tea, and food flavoring extracts. It is used in the garment industry to apply transfers and logos to clothing. Using methylene chloride-based stripping agents to remove bathtub coatings. Working in small, windowless and poorly ventilated bathrooms. Wearing no or inadequate respiratory protective equipment. Wearing the wrong type of or no skin protection. Working without being trained on the hazards of exposure to methylene chloride. OSHA points out that household bathroom fans and/or open windows do not provide adequate ventilation when working with methylene chloride. Employers using the chemical are required to perform air monitoring, and to ensure that industrial-level ventilation equipment is installed to keep the presence of the chemical below applicable PELs (25 ppm for an eight hour shift). OSHA also encourages workers to use long-handed tools when working with methylene chloride — to avoid leaning directly over the source of the fumes — and/or to use respirators, protective gloves, and other appropriate PPE. Because methylene chloride is heavier than air, it tends to linger in the bottom of bathtubs and other places it is used. OSHA also encourages using sanding or non-chemical stripping methods, or switching to chemical strippers that are not methylene chloride-based. For more information on methylene chloride, you can visit the EPA’s dedicated webpage here.